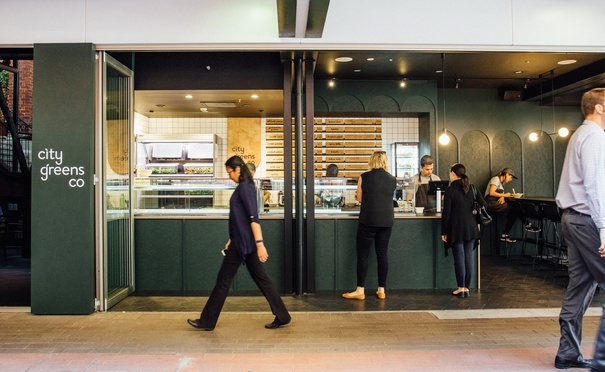 Next time you are in the Perth CBD check out our client City Greens Co in the Trinity Arcade. City Greens Co offers quick, affordable, delicious and nutritious lunch options for those on the go. City Greens Co is Perth’s fastest farm-to-table dining experience. The objective of City Greens Co is to create delicious, healthy food, and provide a fast customer experience through a mobile app ordering facility, while being served in a sleek quality contemporary interior, free of garish signage. The menu is focused on super foods which are organically sourced and nutrient dense. All salads are individually prepared and consist of fresh produce, mixed with old world grains, topped with organic proteins and individually dressed. All items are organic wherever possible and completely gluten free. A range of guilt free raw treats, cold pressed juices and kombucha are also offered. The City Greens Co Ltd salad menu consists of 16 options, freshly prepared from the greens menu (9 items), the grains menu (3 items), the seasonal menu (4 items), or a custom salad upon customer request. Of these, 16 are gluten free, 12 are organic, four are Paleo, seven are dairy free, seven are vegetarian, and one is vegan. Much of the produce is collected from the Perth hills each morning, where the Chef lives. The eco box is ticked through the brand’s use of biodegradable packaging and cleaning products, with plans to compost waste. So next time you are in the Perth CBD make sure your drop by and check out City Greens Co!